Bright Angel Lodge at the Grand Canyon is a fully-registered, historically rich National Landmark. A fantastic piece of inspired architectural achievement and an institutionalized work of art, located along the Grand Canyon’s South Rim. A succinct summation of the overall look and feel of unique desert culture. Bright Angel was all these before it became a formal lodge. Suffice to say, Bright Angel is closer to a wonderful experience than a stopover. Chances are if you didn’t drive yourself, a bus tour or Air tour from Las Vegas brought you here. 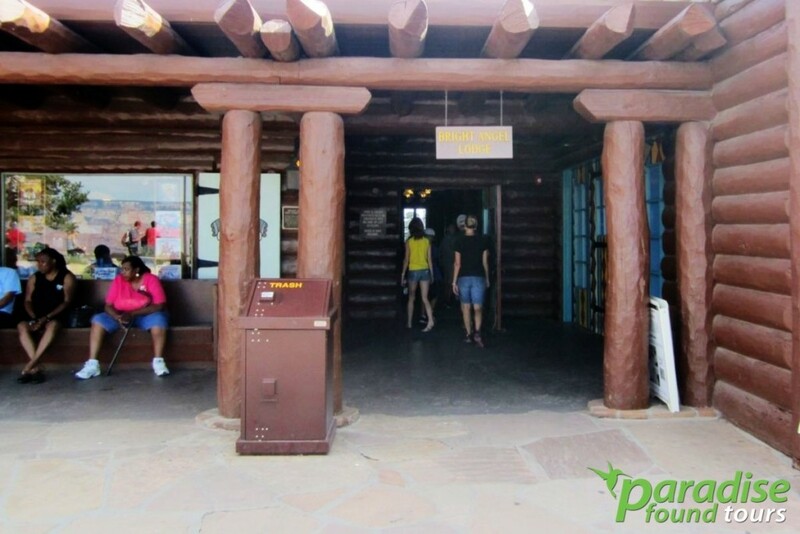 Bright Angel Lodge is usually one of the first stops on a paid tour. You might be wowed while viewing the Grand Canyon’s magnificence from over the rim, but it’s not a truly grand experience if you haven’t seen the canyons from inside Bright Angel Lodge. Bright Angel Lodge is so much more than just accommodation – their mission is to invite people in and make each day of their lodging into a special blend of housing comfort, rustic culture and history as rich as the Grand Canyon itself. Everything, starting from the lodge’s enormous structure, down to the history room is made up of materials such as local limestone, adobe and other wood types. Guests can sample the delicious local menu in the resort’s restaurant, browse through the array of historical artifacts in display, read up on history lessons of the Grand Canyon and Bright Angel, or buy charming postcards to send to their friends and family. They can either go to the lodge’s very own Bright Angel restaurant, or head to the nearby Arizona Room for servings of Midwestern fare such as ribs, fajitas, ice cream sodas and biscuits with gravy. Wooden logs adorn the facade of the Bright Angel Lodge giving the resort a natural and comfortable feel. The Bright Angel Lodge’s design is what makes it stand out from the rest. In 1935, an architect named Mary Jane Coulter created Bright Angel Lodge and fashioned it with an eye for Southwestern design. The property started out as a hotel for weary travelers, then naturally moved on to become a campground. Time went on and Coulter was again called in to redesign the property when railroad construction began in the area. This time she was asked to modernize the resort and make it relevant and at the same time, unique. The architect took inspiration from the resort’s natural surrounding and incorporated wooden logs, adobe, limestone and stone to rebuild the property. The cabins were furnished with antiques, and Hopi paintings could be seen in the lodge’s cocktail bar. Mary Jane Coulter’s vision saved some of Bright Angel’s historic cabins and structures from being demolished, and her unique architectural style added some rustic elements which brought added flavor to the lodge. You can see how Coulter’s keen eye for southwestern comfort saved the lodge by viewing the old-time saloons and feeling the homey vibe in the wood-and-stone cabins. A gentleman named James Thurber built his first accommodation along Bright Angel Trail in 1896. 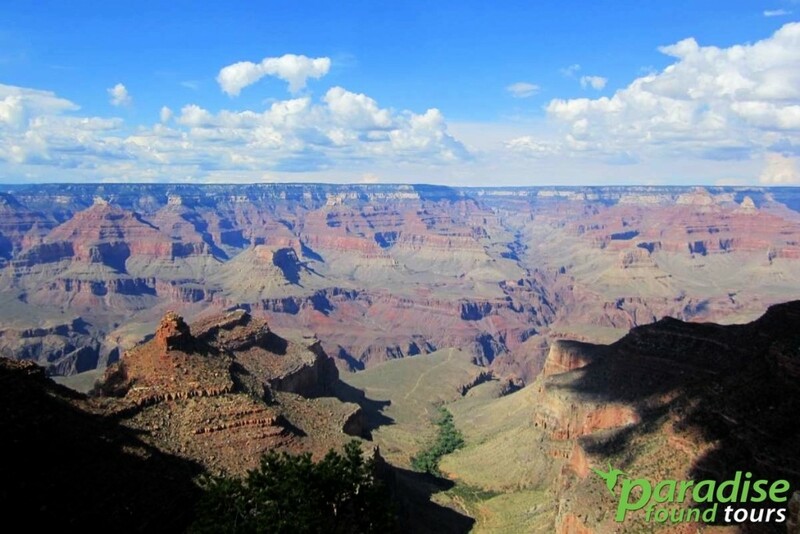 He picked out the Bright Angel Trail’s starting point and built a stagecoach line that led from the Grand view location to his quaint, wooden hotel. Another person named Buckey O’Neill created an accommodation nearby and aptly named it O’Neill’s Camp. Thurber purchased the O’Neill cabin when O’Neill passed away unfortunately during the Spanish-American War. Thurber took over, expanded the hotels and added a tent camp for visitors. He then gave the title of Bright Angel Camps and Bright Angel Hotel to the existing complex. The Bright Angel property changed hands and ended up with Martin Buggeln, an Arizona hotelier at the same time the Grand Canyon Railroad was to be completed. The Bright Angel property was renovated in the 1930s, in which architect Mary Jane Coulter was asked to help. Major improvements included the replacement of tent cabins to one made from logs and stones which was integrated into the natural landscape. The Red Horse Station was used as a post for a member of Roosevelt’s Rough Riders for a good number of years. The Bright Angel Lodge has all the trappings and conveniences of a modern hotel with a few of its own unique charm. There’s the standard gift shop to browse around for knick knacks and souvenirs to give away or take home. The history room lets visitors get a glimpse of the illustrious Bright Angel story. The Bright Angel restaurant serves almost everything, from full family breakfasts to sumptuous gourmet burgers. You can take a breather at the coffee shop, see the old style saloon, or take pictures and buy sweets at the old ice-cream fountain. 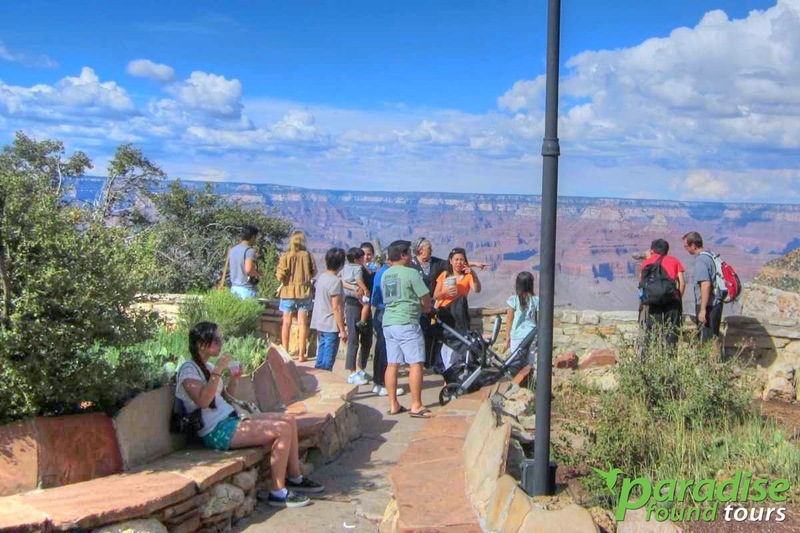 What could be better than an ice cream on a warm day when touring the Grand Canyon South Rim. Lodging in at the Bright Angel is an extra special affair. The usual standard rooms are available, but guests have an option to settle in at either the historic cabin lodging, the deluxe suites or the cabins located around the rim. The special Buckey O’Neill cabins have satellite TV, a private bath, an in-room coffee maker, a refrigerator and telephone. Legend has it that the Buckey O’Neill cabin was once home to one of Roosevelt’s Rough Riders, who was an author and a judge, and was considered to be very important. Staying in the historically famous cabin will cost you $426 per night. 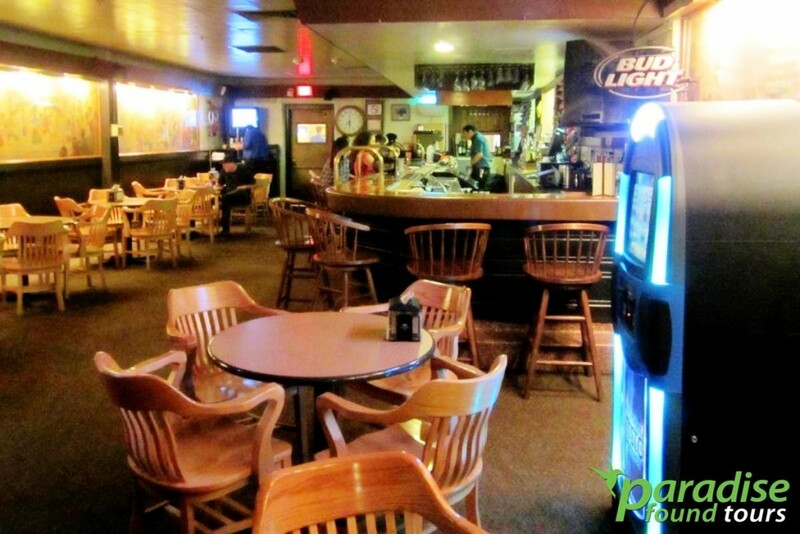 Stop in and visit the Bright Angel Bar after a hike to cool down and fuel up, with a cold beer and order of wings. The décor highlights historic murals and native scenes. The Red Horse Cabin, a two-room bedroom with living space, was known as an important post office for a good number of years. Choosing to stay at this accommodation will cost you $426 per night. Other Bright Angel Lodge rooms are available at the price range of $70 to $207. For a list of current rates at the Bright Angel Lodge, click here. Make sure to reserve your room at the Bright Angel Lodge early if you want to get the best Grand Canyon morning views out of the many rooms available. You won’t be able to book accommodations online- you will need to call them over the phone at 888 29 PARKS, or 888 297 2757. Enjoy a touch of historic and cultural charm as you traverse and explore the landscape, the flora and the fauna. 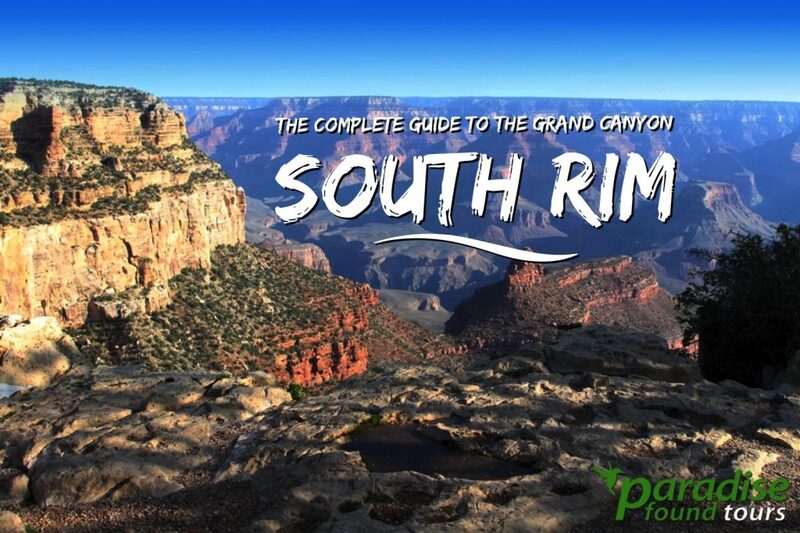 The only real question left is – are you ready for a Grand Canyon vacation? The view of the Grand Canyon behind The Bright Angel Lodge is stunning.